Redwood City officials want your input on recreational marijuana use within the Peninsula city. Residents have until 11:59 p.m. Friday to provide their input in a community survey while the city reviews how its current local restrictions on marijuana use will be impacted by Proposition 64, the statewide marijuana legalization act. The passage of Prop. 64 provided sweeping legalization of recreational cannabis for adults age 21 and over starting Jan. 1. It also provided a framework for the cultivation, manufacture, transportation, storage, distribution, sale and taxation of recreational cannabis. However, local municipalities can decide whether or not to allow commercial cultivation and dispensaries under city ordinances and determine how they will tax the newly legalized drug. So far, California cities and counties have widely differed on their local implementation of the new act. Redwood City, for example, may allow recreation and medical cannabis delivery that is sealed, cash free and fully tracked under State of California regulations as well as impose business license fees, excise and sales taxes to cannabis deliveries. However, it is also considering the ban of commercial and outdoor cannabis cultivation, manufacturing, and processing. This is in contrast to some coastal areas in unincorporated San Mateo County as well as cities such as Half Moon Bay, which are considering the possibility of commercial agricultural growing of marijuana in its greenhouses. BRISBANE: Brisbane has a moratorium on commercial non-medical marijuana related activities and prohibits medical dispensaries in city limits. BURLINGAME: Burlingame has a temporary moratorium on non-medical marijuana related activities until further studies can be completed, including growing personal gardens outdoors. COLMA: Colma has a moratorium on non-medical marijuana related activities until further studies can be completed, including growing personal gardens outdoors. DALY CITY: Currently regulates applications for medical marijuana collectives and allows person recreational gardens outdoors. EAST PALO ALTO: East Palo Alto does not currently allow non-medical marijuana related activities in the city until further studies can be completed. FOSTER CITY: Foster City has a temporary moratorium on non-medical marijuana related activities until further studies can be completed. 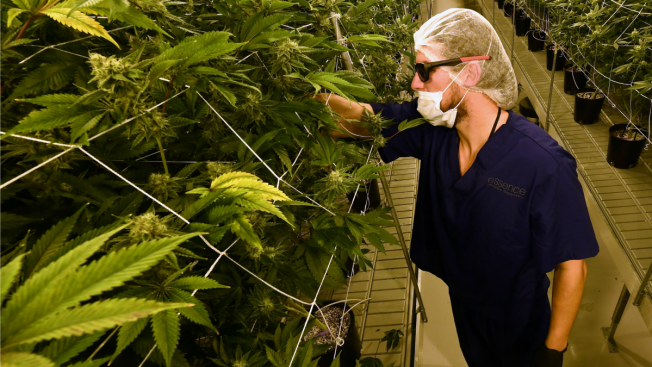 HALF MOON BAY: Currently prohibits marijuana dispensaries, collectives, cooperatives, distributors and production facilities but is considering commercial agricultural growing of marijuana in greenhouses. The next public workshop to gather input for the draft ordinance on commercial agricultural growing will be from 6:30 to 8 p.m. on Sept. 13 at the Ted Adcock Community Center, 535 Kelly Ave. in Half Moon Bay. The Half Moon Bay City Council will discuss the draft during its Sept. 19 regular meeting. MILBRAE: Medical marijuana dispensaries are prohibited pending additional studies. PACIFICA: Currently allows medical dispensaries within the city and is considering recreational marijuana dispensaries, cultivation, delivery and expanding the personal cultivation limit of six plants. REDWOOD CITY: Currently prohibits medical cannabis distribution facilities and has launched a community survey to determine regulations on sale and cultivation of recreational marijuana until Sept. 8. SAN BRUNO: San Bruno has a temporary moratorium on non-medical marijuana related activities set to expire in October. It is currently reviewing its policies on whether to extend the ban to "allow, tax or regulate marijuana businesses," according to a council report. SAN CARLOS: Medical Marijuana Collectives are currently allowed in the city after obtaining a Conditional Use Permit. SAN MATEO: San Mateo allows medical marijuana dispensaries but currently prohibits non-medical marijuana related activities until further studies can be completed. It also prohibits medical marijuana smoke in multi-family housing. UNINCORPORATED SAN MATEO COUNTY: San Mateo County is considering allowing commercial agricultural growing of marijuana in greenhouses, but not sales of recreational marijuana. It currently allows medical marijuana dispensaries in unincorporated areas. This story has been updated to reflect additional city meetings and review periods.